Jockey Richard Hamel attended to his business early and with a bang at Hastings Racecourse Saturday afternoon. After winning the opening race in an $8,000 claimer, Hamel hit the charmed 1,500 plateau aboard Stanz in Command with a late charge to beat favoured Lord Vancouver by a nose in the CTHS Sales Stake for three-year-old colts and geldings. Stanz in Command, owned by Rob Scott and trained by Charlene Miller, finished the 1 1/16 mile distance in a final time of 1:44.49, paying $6.70, $2.90, $2.10. Career victory number 1,501 came in the very next race – a $50,000 CTHS Sales Stake for three-year-old fillies. Hamel won on favoured C U At Eau Claire by five lengths for owner Don Danard and trainer Greg Tracy. C U At Eau Claire finished the 1 1/16 miles in a final time of 1:45.49. At one point the $2.20 payoff winner had a 12-length lead in the four-horse field. 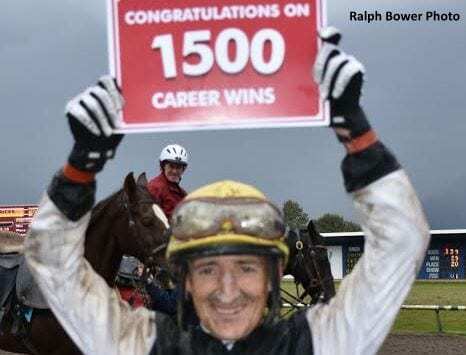 With the three consecutive wins under his belt and the 1,500 career milestone in the record books, Hamel took a back seat to the riding exploits of Alberta invaders Keishan Balgobin and Rico Walcott in Saturday's $100,000 BC Premier's and $100,000 Ballerina, respectively. Balgobin oozed confidence after winning the BC Premier's aboard Killin Me Smalls for owners Deltin Stable and Ed Welsh and trainer Ernie Keller. “I knew he could do it,” Balgobin said after holding off a dramatic charge by 30-1 longshot Venetian Mask in the closing strides and winning by a head. Killin Me Smalls, who went into the race as defending champion, finished the grueling 1 3/8 miles distance in a final time of 2:17.40, paying $5.70, $3.90, $3.40. Walcott rode Snuggles to victory in the Ballerina for fillies and mares for owners Swift Thoroughbreds and trainer Dino Condilenios. Snuggles prevailed over Victress, the only two three-year-olds in the race, in a final time of 1:50.26 over 1 1/8 miles for fillies and mares three years old and up. This entry was posted in People and tagged 1500 wins, CTHS, cths sales stakes, Hastings Racecourse, richard hamel by Press Release. Bookmark the permalink.